Everything went extremely well today, but I’m feeling a little uneasy at the moment. Luckily, I have some time right now and (later tonight) I’ll get to see three of my favorite bands. And I’ve got a lot of great friends. Speaking of which, two of them offered to pay me for a quick sketch today. Here’s my cartoon Megan and Servo. 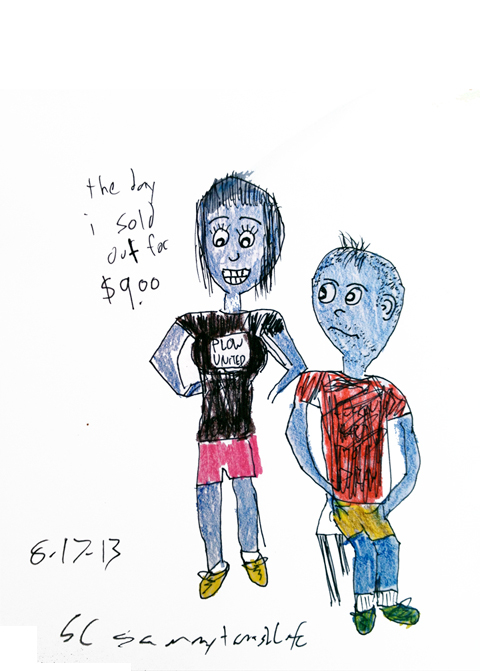 “The Day I Sold Out For Nine Dollars.” 8/17/13. Pen and (dry) watercolor pencil. 5×7″.